In the NGLE program some old windows have been replaced with new windows with the same functions but which also contain more information. 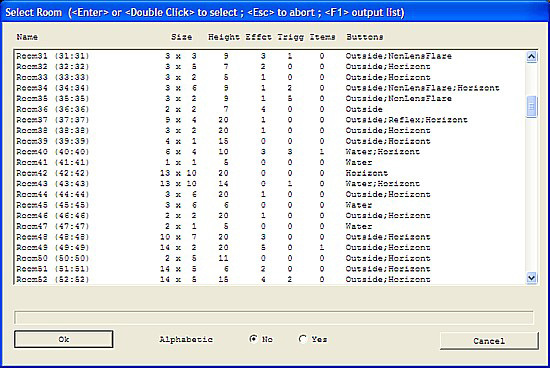 This is same slot name you find in objects.h file in trle folder. Number of meshes that form the object. Statics always have one mesh. Sprite has no mesh but a single face. Relative Mesh Index. This is the index number of the first mesh of the current object. This is the same value you see in StrPix as #mesh. You could perform an output list (F1) and print the list to have references for each object to locate easily its mesh in Strpix. Absolute Mesh Index. This is an absolute index value of the first mesh of the current object. Theoretically (if unofficial tools work fine) this index should always be the same even when you add or remove objects from your wad. This is true overall for important meshes, like the single mesh of moveables. Collision. There is some doubt about the meaning of this field. However, it should be the collision used only for the collision sphere of moveables. It should be ignored for statics. Animation Index. 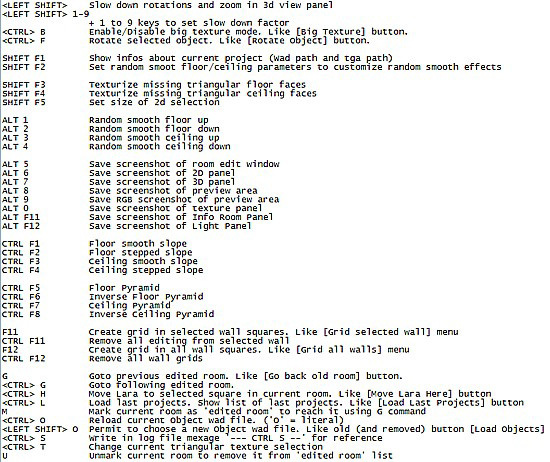 Index of the first animation for the current moveable (not used for statics and sprites). Room name. If room is not yet used the name will be empty followed by the room index. Room size in blocks, excluding bounded walls. Number of moveables + statics placed in this room. Damage: Lara loses life while she is current room. Set damage with DAMAGE script command. Cold: Cold room. Above ground, Lara's breath is visible; in water rooms, Lara will take cold damage and lose health when it runs out. You can select an animation range in the same way as with the old room editor - use right mouse button to select an animation range and keeping the button down drag to select the range of desired textures. Use the left mouse button to select an animation range already created. Start a preview of the current animation range. This preview will use the frame rate currently selected in the right combo box. The preview will continue until aborted by hitting the ESCAPE key. Assign to the current animation range (in red frame) the frame rate value showed in the left combo box. It is necessary to hit this button to assign frame rate. If you don't assign the frame rate to the animation range, it will be visible in preview mode but will be lost when you close the window. This button is visible only with v50 projects, that is with projects using textures 128x128 pixels as the default. This button reduces temporarily the size of textures to 64x64 pixels to host more textures on the page. You can set different frame rates for each animation range. The default frame rate in tomb raider is 30 fps (frames per second). This default frame rate is very high and is therefore only good for long animation ranges. Now with the facility to use lower frame rates you can use fewer textures to get decent animations. As an example, animated gifs usually have a frame rate of 5 to 10 fps. In addition to fps you can also use spf (seconds per frame) settings, slowing down animations even further. For example if you have a setting of 3 spf, the texture will change only after 3 seconds. In this window you can associate sounds and bump map effects to specific textures. 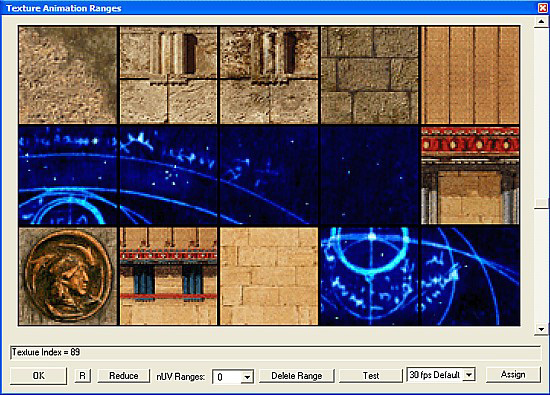 Now you can select a a wide range of textures and assign a sound or bump map effect to the whole range. Note that you can set sound and bump map effects only to the first 256 textures. Beyond that point, textures will appear with a red cross through them. 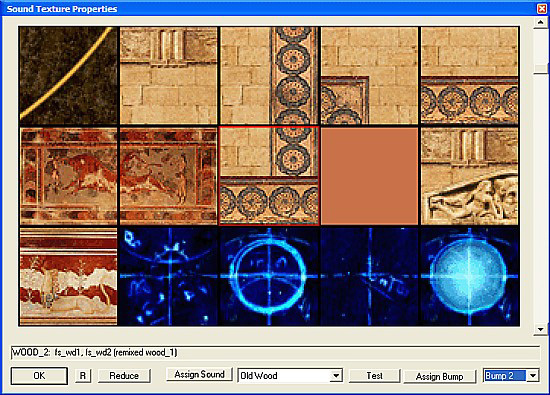 To assign a sound, click on the Assign Sound button when there is a texture (or a texture group) selected. This must be done or no sound will be assigned to any selected textures. You can play the sound sequence for the current texture by clicking on the Test button. You can also select in the combo box any sound and hit the Test button to hear it. This operation doesn't change any sounds assigned to current textures. Note that the sound you hear with the Test button is not exaclty the same as you'll hear in game. Some changes to pitch will be not performed using the Test button. Moreover, the sequence of sounds in game will be overlapped while the Test button will only play a common sound sequence. When you select a sound type in the combo box, the specific samples name used will be displayed in the info row.